16 And he said unto me: Knowest thou the condescension of God? Nephi was shown a vision to understand the interpretation of his father Lehi’s dream. After being shown the tree of life, which beauty thereof far exceeded any other beauty, he asked to understand the interpretation. Many religions throughout human history have believed in the concept of a human incarnation of God. Additionally, there are many beliefs related to God sending his Son to live as a human on Earth. Is this simply because the idea has resonated with humans in different nations and cultures throughout history? Or is the idea planted in some kind of absolute truth? To illustrate why we resonate so much with this idea, let’s look at the Hindu belief about Krishna. Hindus believe in various carnations of God, but the most important one is probably Krishna. Krishna is said to have been born about 3,000 BC, though beliefs in him and details about his life were not materialized until about 400 BC. The Hindu scripture Bhagavad Gita is a dialogue as if spoken from his voice. Krishna was a child, friend, servant, singer, dancer, romantic lover, cowherd, ruler, warrior, and teacher. For millions of Hindus, his life is used as an example of how to live. Similar to Christian view, he showed example of righteousness but also example of how to live joyfully and relate to his environment. He also showed his love for people, and his romantic relationships are seen as a symbol of God’s love for man. Remember when your big brother risked his reputation to hang out with you and your friends and how awesome that made you feel? God descending to man was the ultimate example of the cool, popular kid eating lunch with the nerds at school. There’s a two way relationship in this. The human family is getting something. They get understanding about God. They receive his love. They are shown the example of how to live. Their faith in God is justified as they see him face to face. They learn he cares about us enough to do this. And God is getting something out of this. God is understanding what it’s like to be a human. Our LDS scriptures, expanding on New Testament ideas, portray this beautifully. 11 And he shall go forth, suffering pains and afflictions and temptations of every kind; and this that the word might be fulfilled which saith he will take upon him the pains and the sicknesses of his people. 1 And now Abinadi said unto them: I would that ye should understand that God himself shall come down among the children of men, and shall redeem his people. 4 And they are one God, yea, the very Eternal Father of heaven and of earth. 5 And thus the flesh becoming subject to the Spirit, or the Son to the Father, being one God, suffereth temptation, and yieldeth not to the temptation, but suffereth himself to be mocked, and scourged, and cast out, and disowned by his people. He came to die for us. But he also came so that he could relate to us. We (both LDS specifically and Christian world in general) are kind of hamstrung how we view this and teach this doctrine. On one side, we’re very overcome with the love and the emotions that are evoked by the idea that God would descend from this throne divine, to be born on Earth in a lowly stable, in the very normal unheroic setting the Jesus Christ was raised, and to suffer as humans suffer so he could relate to us, so he could succor his people. On the other side, we believe Jesus lived a perfect, sinless life, that he taught perfect doctrine, had perfect reactions, showed a perfect example, which led to his ability to atone for us. However, can a perfect, sinless, all knowing, all powerful being truly experience a human life? Could Jesus as perfect and sinless truly experience hunger, pain, suffering, temptation, guilt, doubt, confusion, boredom, anger, lust, regret, inadequacy, and loss? We’re stuck in the middle a bit. If we imagine him as perfect and sinless, it seems to lessen the power of it. How is it difficult to endure human frailty if you’re divine? If you have perfect knowledge of the outcome or perfect control of your emotions, not prone to vices, it’s not really the same thing. I think it’s useful to imagine Christ as being human enough to experience those things the same way we did. I don’t think it should change the doctrine to imagine him as experiencing life as a true human, and true humans sin and screw up and have guilt and regret and have to manage physical desires like hunger, anger, and lust. When the angel showed Nephi the virgin Mary and asked “Knowest thou the condescension of God?”, Nephi answers something like “umm, not really, about all I know is that God loves his children.” That’s actually not a bad starting and ending point for religious doctrine. But the angel goes on to show him more of the vision. 18 And he said unto me: Behold, the virgin whom thou seest is the mother of the Son of God, after the manner of the flesh. 19 And it came to pass that I beheld that she was carried away in the Spirit; and after she had been carried away in the Spirit for the space of a time the angel spake unto me, saying: Look! 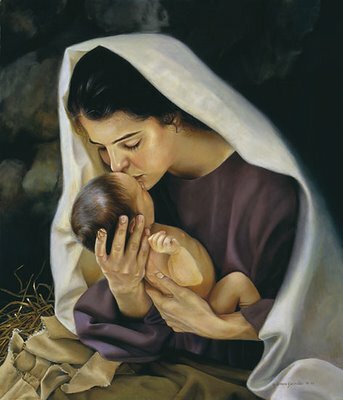 20 And I looked and beheld the virgin again, bearing a child in her arms. 21 And the angel said unto me: Behold the Lamb of God, yea, even the Son of the Eternal Father! Knowest thou the meaning of the tree which thy father saw? 22 And I answered him, saying: Yea, it is the love of God, which sheddeth itself abroad in the hearts of the children of men; wherefore, it is the most desirable above all things. Chills. These might be my favorite verses in all of scripture. The angel shows Nephi the baby Jesus and tells him it’s the Son of God, and asks the same question as before, but rephrases so now he knows the answer. Knowest thou the meaning of the tree which they father saw? Is the same question as “Knowest thou the condescension of God?” The fruit of the tree of life is the love of God. The love of God is demonstrated in the act of sending his son. How could the Father tell the world of love and tenderness? What does he ask? Live like his Son.